If you are a fan of Czechoslavakian pottery, you must "Chzech" out this new book! It's filled with pieces of this beautiful pottery divided into categories such as: baskets, tea sets, pitchers, plates, figurines, and more. A detailed section in the back provides descriptions of these items as well as values. 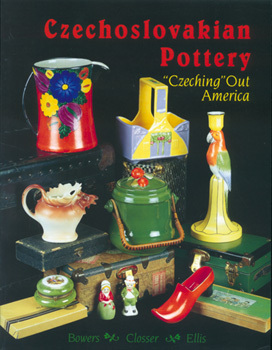 Also included are tips and techniques on collecting, as well as chapters on: patterns, history of Czechoslovakian pottery, marks, price vs. fair market price, and more. This beautiful and valuable guide is must-have for collectors, dealers, or anyone who appreciates the beauty of Czechoslovakian pottery.